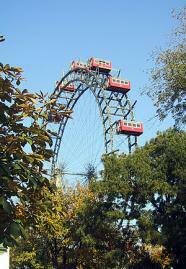 This is one of Vienna's main tourist attractions: The Giant Ferris Wheel in the Prater. Famous from the movie 'The Third Man' and many more. The wheel is visible from the window and within a 5 to 10 minute walk from the apartment.